Incredible benefits to the body, mind and spirit are plentiful. Even a short run leaves me energized. The best memoires of a marathon are the ones I had to dig deep to finish the distance. Most rewarding is having a hand assisting others to reach their goals. I love doing this! Hearing the stories of what motivates one to run are always inspiring. Knowing I had a chance to share in their day is the absolute best! 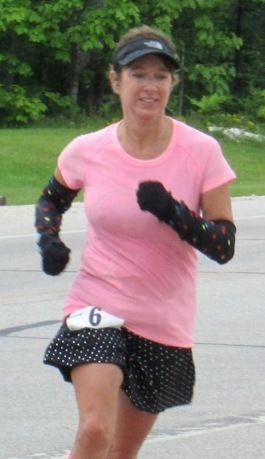 The joy of reaching the finish line is wonderful especially when shared having fun along the journey. We will run a consistent pace with short walk breaks at the aid stations. Only thing I require.... A SMILE as you run to that finish line! I am mom to 3 fabulous children. I have run a marathon in every state. My longest race was a 500K. I was one of the top 3 women to have run over 70 marathons in a single year. I’m always seeking new adventures.